It's August and red is the colour of the month! 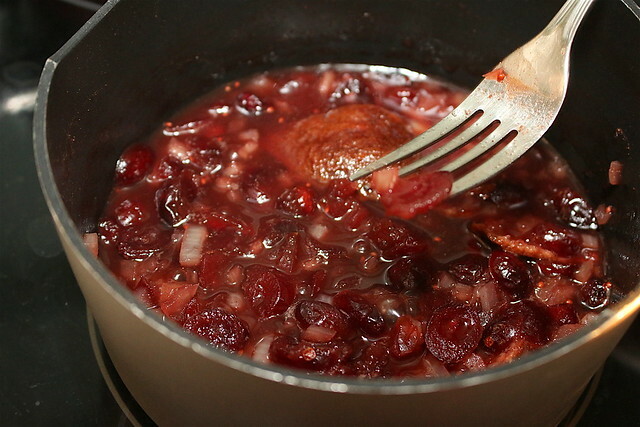 So, let’s add a burst of RED with cranberries! As we celebrate our national month, let’s enjoy a dose of fruity red to our daily diet (in the way that we are supposed to eat a rainbow). One of the easiest ways to do that is to eat more antioxidant-rich, ruby-red cranberries. Here’s a nutritious yet easy-to-make Grilled Salmon with Five-Spice Cranberry Relish that is one of the ways to creatively include cranberries into your diet. It's a recipe I tried recently which has a unique combination of flavours. But most importantly - my family loved it! My daughter even asked me to make this every day which is astounding because my kids normally dislike fish. They won't eat salmon of any kind, including the popular salmon teriyaki at Japanese restaurants. But salmon is such a superfood, so I am always trying to find ways to work it into their diet. This recipe has finally changed their perception of the fish! Now they get so excited when I say I'm making this for dinner. Initially, I was unsure about how five-spice powder would work with dried cranberries, as both have such distinct flavour profiles, but I was pleasantly surprised by the results. The warm spice aromatics played well with the natural, bold and uplifting taste of the fruit. Here is the original recipe is from Ocean Spray, but I have listed my modified version below (link to printable version at the end). Like most Singaporeans, I do not have a grill in my kitchen, but pan-frying works just as well. I hope this will inspire you to create more cranberry creations of your own! 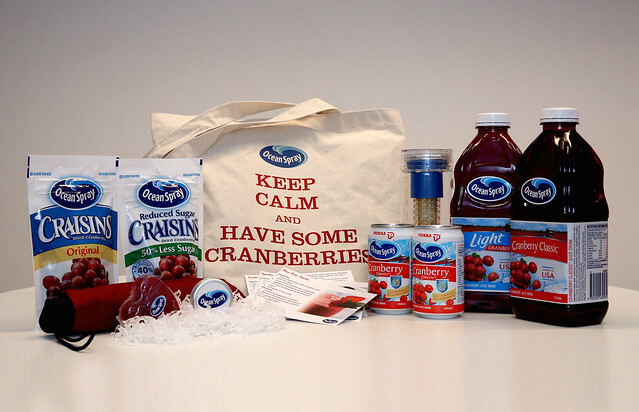 Speaking of Ocean Spray, you may know them as the leading brand for cranberry products in the U.S. I do love dried cranberries. You can't let me have the whole bag of Craisins; I won't know when to stop eating. Fortunately, cranberries are a natural and nutrient-dense superfood with unique elements that rejuvenate the body from within, so they are a wise choice for a healthy snack. The power of the cranberry centers on its ability to help cleanse and purify the body. Cranberries also help to reduce certain infections and therefore the antibiotics use, thanks to a combination of compounds, such as Type-A proanthocyanidins or PACs. These properties help prevent certain bacteria from sticking to the walls of the intestines and causing urinary tract and stomach infections. A landmark global study also found that drinking one 8-ounce (240ml) glass of cranberry juice cocktail daily is a good measure to help reduce the amount of recurrent UTIs and therefore antibiotic use. WebMD says "In disease-fighting antioxidants, cranberries outrank nearly every fruit and vegetable--including strawberries, spinach, broccoli, red grapes, apples, raspberries, and cherries." There are many easy ways to incorporate cranberries into your daily diet and enjoy one of Mother Nature’s power fruit! 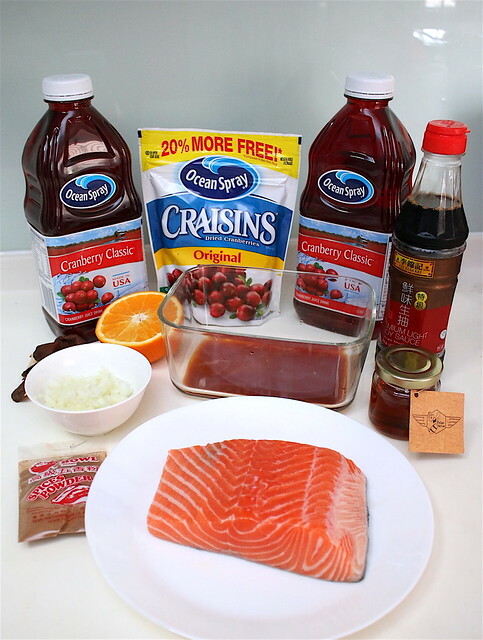 Apart from this salmon recipe, cranberries can also be added to your breakfast cereal bowl, or into your salad! 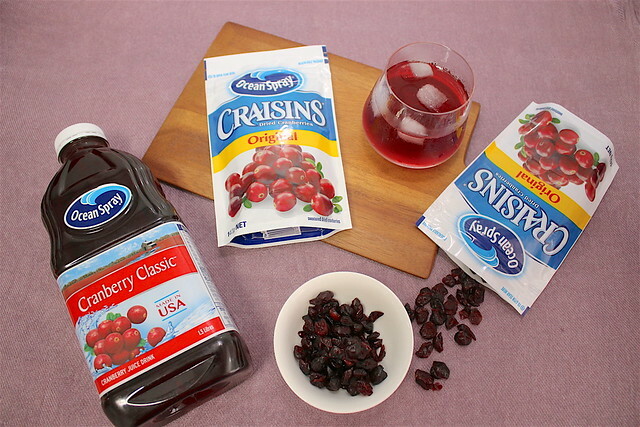 For more cranberry infused recipes, visit Ocean Spray’s official website. I’m also running a contest for one lucky winner who will be receiving a set of Ocean Spray and cranberry infused products valued over S$100. So, on with the recipe that has both superfoods - salmon and cranberries. Feel free to get creative with cranberries in main dishes, not just salads, bakes and desserts, and incorporate the super fruit into your daily diet! Combine and mix well the soy sauce, orange juice and honey in shallow glass or plastic dish (I used my rectangular Snapware glass container for the marinade). Add salmon, skin side up. Cover and refrigerate 30 minutes. While the salmon is marinating, you can make the relish. Combine all relish ingredients in medium saucepan. Cook over medium heat until mixture boils, stirring occasionally. 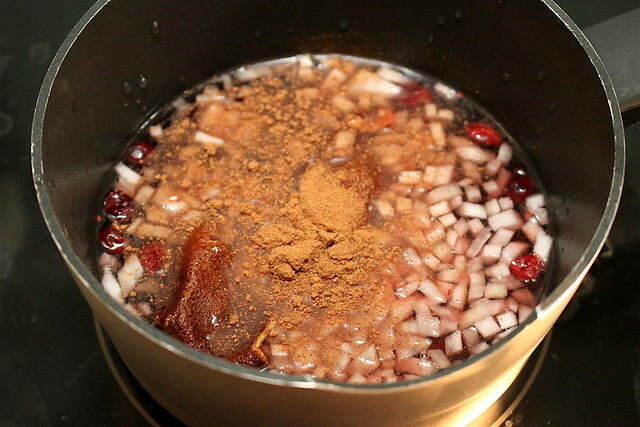 Reduce heat; simmer 6 to 8 minutes or until onion is tender and mixture thickens. Set aside to cool. Yes, you kinda want this jam-like consistency. I needed about 12 minutes to achieve this. Heat pan. 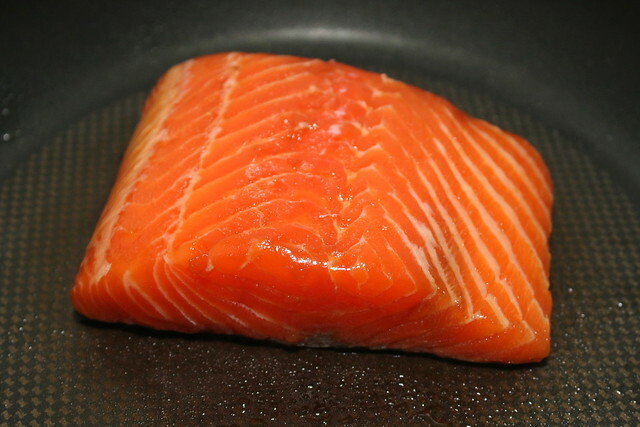 Place salmon in pan, skin-side down. Cook 5 minutes over medium heat. Turn it over and cook another 4 to 8 minutes or until flesh is opaque and flakes easily with fork. Remove salmon with wide spatula and place on serving platter. Cut salmon into 4 pieces. Serve with relish. Here's the link to the printable recipe on Yumprint! It's a convenient one-page recipe without the step-by-step photos. You can easily use the Ocean Spray products in other ways. 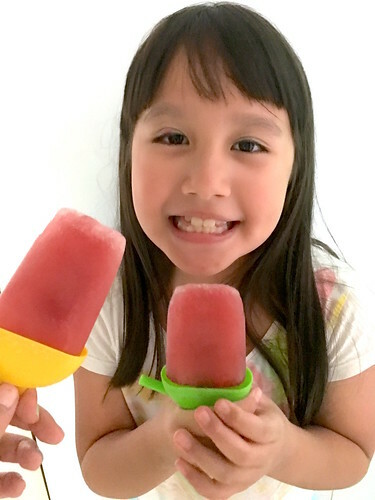 I had some leftover Cranberry Classic juice, so I tried making popsicles. They turned out perfect! The cold treats are a godsend really these days, given the ghastly heat! Just pour them into the moulds and freeze. You don't need to add anything else. The kind folks at Ocean Spray are giving out one set of Ocean Spray products worth over S$100 to one lucky reader. 1. Like the Camemberu Facebook fan page, and the Ocean Spray Facebook page. 2. Comment below letting us know your favourite way to enjoy cranberries (you can also post a link to a recipe or a photo). 3. Send me an email (camemberu@gmail.com) with the subject "OCEAN SPRAY GIVEAWAY" to let me know your entry so I can have your email to contact you if you win. Extra chances to win on Facebook! Closing date is 2pm, 2 Sept 2016. We will pick one winner and contact them to arrange prize pickup.